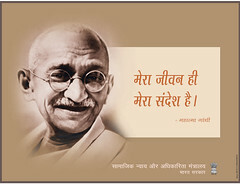 Gandhiji's relevance in present era. Where we forget these principles ? When the west is following Gandhiji's ideal we only remember him on Gandhi Jayanti, How sad ? You are absolutely right that we only remember Gandhiji on Gandhi Jayanti.This is really very sad thing.Thank you very much for this post.